Earlier this week, I promised I'd Shout Out to an awesome artist I met at Bazaar Bizarre. While my husband and I were going through our second round to make purchases, we realized we completely missed Martin's booth! "How'd we miss this?!" We were drawn in by his illustration style. 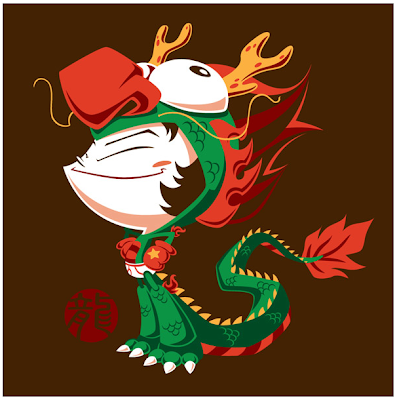 And since Brandon was excited about the dragon boy illustration, I bought him the t-shirt. :) From what I got out of small talk, he seemed like such a chill, happy and humble person. (There was another vendor there that seemed too into proud of his work and that was such a turn off in a buyer kind of way.) In any case, his work at the craft show made me want to see what else he'd worked on so I went to his website and was blown away by all his illustrations, paintings, etc. He's the creator behind Ruby Gloom and currently, a character designer for the Nickalodeon show, Ni Hao, Kai-lan! Check out his website to see other works or stop by his shop here! :) Which was your fave?